Marsh, James H.. "Acadian Civil War". The Canadian Encyclopedia, 25 January 2019, Historica Canada. https://www.thecanadianencyclopedia.ca/en/article/civil-war-in-acadia-feature. Accessed 21 April 2019. 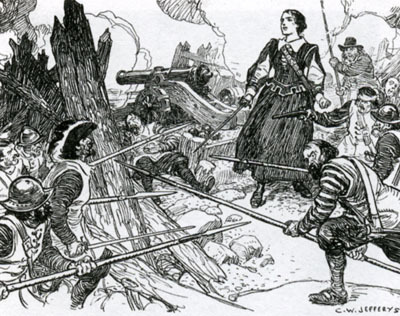 Madame La Tour bravely defends the fort against d'Aulnay's assault (drawing by C. W. Jefferys, courtesy Library and Archives Canada). A fort under siege. A valiant leader inspiring defenders against hopeless odds. Hand-to-hand sabre duels, musket fire, then treachery and brutal reprisals. No, it is not the Alamo, but a scene from early Canadian history, and it has still more twists to reveal. Acadia was from its beginnings a centre of conflict and competing ambitions. Neglected by France, it was the victim of aggression whenever the privateering spirit moved some New England adventurer. The most destructive conflict in the early days, however, was among the French themselves, in particular between the two of the most powerful characters in Acadian history. One was Charles de Sainte-Étienne de La Tour, an ambitious, resourceful man ‒ a born leader with the happy ability of inspiring loyalty. The other was the equally ambitious, ruthless, intelligent and very well connected Charles de Menou d'Aulnay. While La Tour's backers were mercantile, d'Aulnay was related to none other than Cardinal Richelieu, the most powerful man in France. In 1635, Isaac de Razilly, lieutenant-general in Acadia, died suddenly. In their complete ignorance of Acadian geography, King Louis XIII's bureaucrats divided Acadia between the two men, but left crucial parts of each one's territory in control of the other. The two men actually came to blows at Port-Royal in 1640 when La Tour arrived to pick up furs and supplies there. When d'Aulnay learned that La Tour was seeking help in Boston, he hastened to France and persuaded the court that his rival had committed treason. Throughout the struggle that ensued, La Tour had a courageous ally in his wife Françoise-Marie Jacquelin. In 1642 she avoided d'Aulnay's blockade and made her way to France, where she fought the order that her husband be arrested for treason. When forbidden to leave France she borrowed money, escaped to England and chartered a ship. Off Cape Sable, Nova Scotia, the vessel was stopped by d'Aulnay but she eluded him by hiding below in the hold. La Tour's prime settlement was the fort he named for himself, erected in 1631 on the site of present-day Saint John, New Brunswick. In April 1645, d'Aulnay got word that La Tour had left the fort to meet with his supporters in Boston. He ordered up every man who could carry a musket and sailed across the baie Française (Bay of Fundy) to lay siege. D'Aulnay's emissary carried a summons to the fort for surrender but it was promptly dismissed by Françoise-Marie, who was determined to fight. D'Aulnay set up a battery on shore and brought his heavily armed warship in range. His last call for surrender was met with catcalls and insults and the defenders ran up the red flag of defiance. D'Aulnay promised to give quarter (reprieve) but once he was in control, he broke his word. In a fury over the stubborn resistance, he gave orders to hang all the survivors, except one who agreed to act as executioner. In the wreckage, Françoise-Marie stood bound with a rope around her neck, forced to watch as her men were slowly strangled to death. Françoise-Marie was spared, but when d'Aulnay discovered that she had tried to send a letter to her husband through a Mi'kmac ally, he ordered her to be put into severe restraint. She fell ill and died. Charles de La Tour did not hear about the death of his wife and the destruction of his fort until late June. At the age of 52 he had lost everything. Still, he managed to drum up more support in Boston and returned briefly to Acadia before making his way to Québec. There he spent four years restoring his fortunes in the fur trade and participating in the wars against the Iroquois. Then, one day in May 1650, d'Aulnay's canoe overturned in the river basin off Port-Royal and he died of exposure. La Tour was soon bound for France, where he managed to restore his name and authority in Acadia. In perhaps the strangest twist in the whole tale, he wooed his rival's widow, married her and adopted his eight children, adding five more of his own. This early phase in the history of Acadia ended in 1654, when the English rampaged around the baie Française, destroying settlements and disheartening the inhabitants. When the struggle began, France had high hopes for its Acadian venture. In the end the civil war between its two most powerful characters left it exhausted and easy prey. La Tour spent the last ten years of his life in retirement at Cape Sable. In all, he had been a resident of Acadia for 56 years and his descendants today are found throughout Canada and the United States. Bona Arsenault et Pascal Alain, Histoire des Acadiens (2004); Brenda Dunn, A History of Port-Royal/Annapolis Royal, 1605-1800 (2004); Sylvain Godin et Maurice Basque, Histoire des Acadiens et des Acadiennes du Nouveau-Brunswick (2007); Gilles Havard et Cécile Vidal, Histoire de l’Amérique française (2003); Nicolas Landry et Nicole Lang, Histoire de l’Acadie (2001); M. A. MacDonald, Fortune & La Tour: The civil war in Acadia (1983). Bona Arsenault and Pascal Alain, Histoire des Acadiens (2004); Brenda Dunn, A History of Port-Royal/Annapolis Royal, 1605-1800 (2004); Nicolas Landry and Nicole Lang, Histoire de l’Acadie (2001); M. A. MacDonald, Fortune & La Tour: The civil war in Acadia (1983).